Once the rice has been harvested in the paddy, all the excess moisture in the grain must be extracted in order to preserve it in optimal condition. Most companies now use artificial drying methods that involve burning solid fuels in ovens and mechanical dryers. 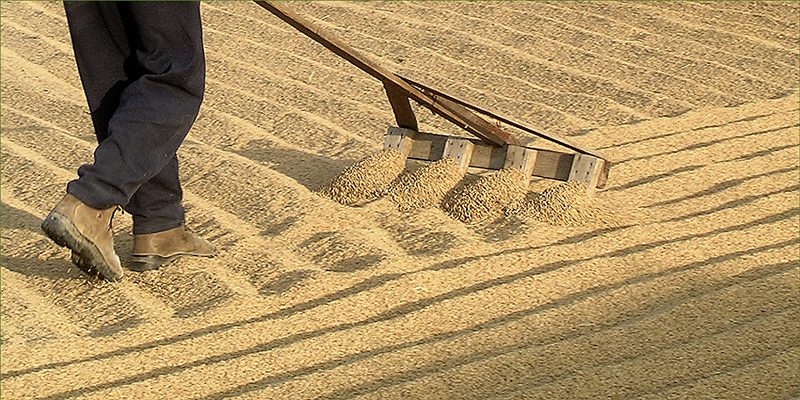 What we do and what yields a highly differential end result in grain quality is drying the rice out on the threshing floor, using the sun as the energy source, just as our ancestors did for centuries. This ensures exceptional quality without altering the natural latency process of the rice grain, while also saving energy and avoiding pollution. After threshing the grain with the help of a little mechanical cleaner to extract any impurities and dust, it is stored for three months in the granary for a second stage of maturing. When the grain is completely stable, it is transferred to silos outside, where it is kept under controlled temperature and humidity conditions and from which the grain required for processing is taken each week.